Planet Dog products are tough, eco-friendly, and saving lives. My black lab, Emma, has only had 3 dog toys in the last 5 years. (Queue comments about how she is a poor, deprived puppy.) If you have a black lab, you probably understand that they are lovable, loyal, with so much personality – but can also have a tendency to chew and destroy. We gave her several different toys when we brought her home for the first time, and each was missing a head/tail/stuffing/squeaker within a couple minutes. She never really bonded with a toy like the adorable, heart-melting Dachshund in the commercials with its well-loved stuffed dog, Bobo. 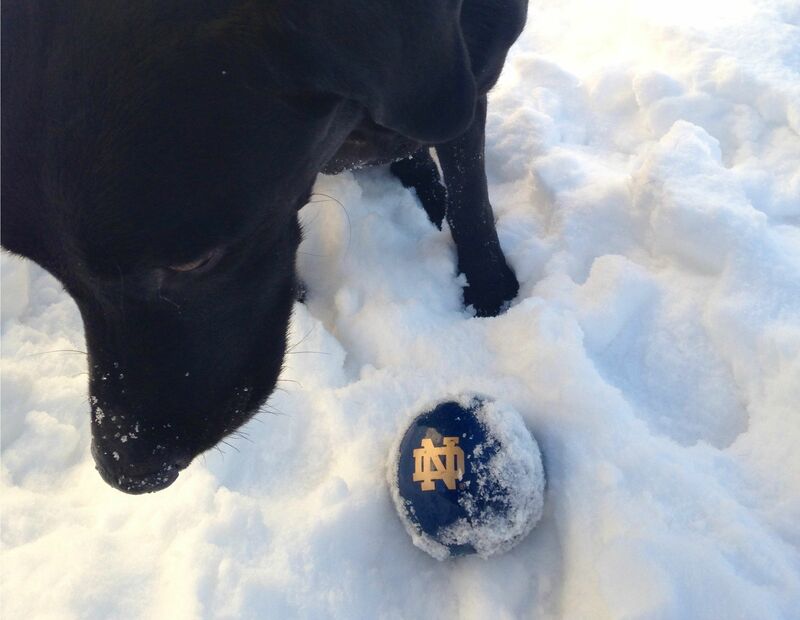 Until we brought home her blue Notre Dame Campus Dog® Orbee-Tuff® Ball last winter. 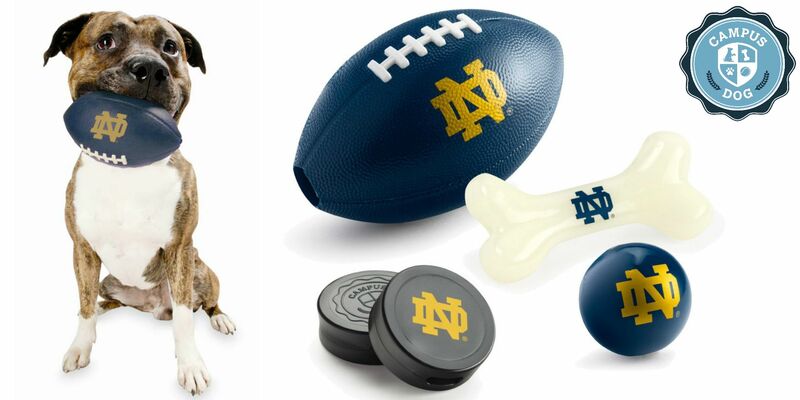 This toy is part of Planet Dog‘s new Campus Dog line of products specifically made for Notre Dame. That guarantee is the cherry on top. If any Planet Dog product is chewed, destroyed, doesn’t fit, if the dog doesn’t like it, if you are not satisfied for any reason whatsoever… you can return it. This is the best part about buying a Notre Dame Campus Dog product. Ten percent of the net profits are donated to organizations that provide assistance dogs to people in need. Since 2006, the Planet Dog Foundation has donated more than $1 million in cash grants and product donations to non-profits that train, place and support dogs working to help people in need. The mission of the Planet Dog Foundation is to promote and celebrate programs in which dogs serve and support their best friends. We fund and support all dogs working to enhance and save human lives. Ellen Chaleff, a senior at the University of Notre Dame, can speak first-hand to the importance of service dogs. Her Dachsund/rat terrier mix named Fred is her constant companion on campus, and helps her manage her bipolar disorder. In an Observer article last winter, Ellen shared details of her relationship with Fred. “I love my service dog more than anyone. We are together 24/7, he has saved me so many times. He’s my best friend, and when I’m in a dark place with my disorder, he’s everything I need,” Ellen told us recently. The cost of obtaining a service dog can be an insurmountable obstacle, and the Planet Dog Foundation is committed to bridging the gap. The people behind Planet Dog are giving you an opportunity to interact with their products and their mission this weekend. Stop by the Bookstore on Friday and Saturday for demonstrations, activities, a visit from Ellen Chaleff and Fred, Leader Dogs for the Blind, and more! All humans and dogs are welcome. The best part: Planet Dog will be donating a portion of the proceeds from this event to Leader Dogs for the Blind, and Hammes Notre Dame Bookstore will be matching the donation. This entry was posted in Uncategorized by notre-dame-licensing. Bookmark the permalink.